Tall tripods for overhead viewing? Let me start by saying that I am really enjoying binocular astronomy. I got my binoculars a few months ago and I haven't done this much stargazing in a long time. Much more so than when I just used telescopes. Anytime there is some clear sky, I'm out there. I think it is a combination of it being truly 'grab and go' and the pleasure of watching with both eyes open. Since I mounted my bins on my 30 year old tripod, things have gotten even better. It is amazing how much more I can see on a stable mount, as compared to hand-held or mounted on a monopod. So the views are great, but I am running into a bit of a problem: My tripod (seen below) is not that tall when fully extended. I get good views up to an angle of about 45 degrees. Anything higher gets uncomfortable. I am aware that they make parallelograms to aim binoculars, but they all seem very heavy and I would lose the grab and go convenience that gets me out under the stars so much. So I am wondering if anyone is using and liking the taller tripods that are for sale. For example I came across the Oberwerk 5000 (link). Can anyone comment on the ease of viewing higher up in the sky with this kind of tripod? I have an Orion Paragon HD-F2 Heavy Duty field tripod & fluid pan head. Range of motion on vertical axis is 180 degrees and 360 degrees on horizontal axis. The height when fully extended is 69 1/2 inches. It weighs 7.5 lbs. My 15X63 binos weigh 2.6 lbs. I thought I knew the recomended weight limit but can't seem to find it. I am very happy with the tripod. Observing at zenith is always uncomfortable but anything less than zenith is just fine. Very stable (if I keep my hands off!). doesn't really matter how tall your tripod is, you have discovered why they make binos with angled oculars! a taller tripod will help but if you want to view at zenith and near zenith comfortably, you are going to need binos with 90* EP's. I am ok with not being able to see at the zenith, I can just wait until things move to a lower angle. But I would like to view a bit higher than 45 degrees up. That may not be tall enough for me. I am 6feet, 1.5 inches tall and my current tripod will go up to my eye level with the center column fully extended. I just can't get under them easily at that point. The Oberwerk is listed as going to 84 inches (7feet), so I am curious if that has worked for anyone? the Oberwerk 5000 with their 25x100 straight through binoculars were my first foray into big binocular astronomy. I loved the combination. As to ease of seeing, it was fine probably up to about 75 degrees, after that it was a contortionist act. It is not a matter of height at that point but the angle that you have to get your neck to see through the eyepieces. In fact I would use the tripod almost as low as I could get it and sit in a small chair sliding my body underneath the tripod when looking that high. 75 degrees sounds good to me! That is a lot more than my current 45.
looks like a good fit for you. The crank up elevator would seal the deal for me if I were in the market. You can sneak in a little extra elevation by cranking the binos up high and then rocking the tripod back on two legs. My standard answer to this question is to make sure your tripod/head can hold your binos at least 6" taller than you are for standing viewing. The binos must be held above your eyes for looking at higher elevations and a too short tripod is just plain inadequate. The Obie 5000 tripod/ head is likely the most reasonable new option that fits the bill for you. It's a knockoff of the Manfrotto type tripods. On the used market, the 26# rated Bogen/Manfrotto 3046 (028) or 3036 (075) tripods are good choices; both can reach into the 7' range. The above tripods have geared elevator columns which are very handy for the "mini-adjustments" in height necessary for astronomy use. I'm 6'2"; I have two Manfrotto 3036 tripods I use for grab-n-go, easy setup. Both are equipped with 2-way video heads; one with a Manfrotto 3063 head rated for 11# and the other with a 503HDV rated for 17.6#. The 3063 head is fine with my 16x70mm binos and the other handles the heavier binos like the WO 22x70s and my 100mm BT. The 501HDV head rated for 13# is a good option, too. Edited by Rich V., 06 February 2019 - 01:03 PM. 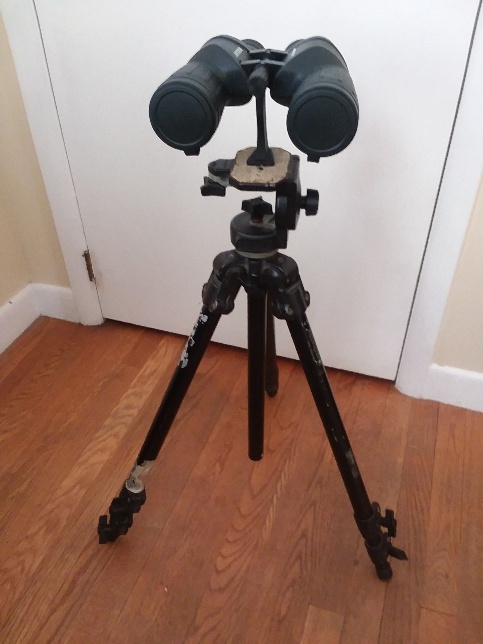 My mount / tripod system is listed in my sig, as are the two larger Oberwerk binoculars that I mount on it. I cannot very well, due to the constraints of the mount itself, view near the zenith, but that does not concern me too much (and same for you, OP, as you stated). I do extend all three tripod legs by one (the first) of the two extendable leg sections (not by the second, last, and thinnest set, for reasons of stability), and raise the binoculars further as needed by the center column, by means of a convenient hand crank. Then, I sit in my low lawn chair (or kneel below on one leg if viewing near overhead, as both binoculars are straight-through) and observe away! I slump under it on a compact camp seat so I can go up to zenith (monopod at an angle with the base spike by my feet) Maybe not quite as stable as a tripod, but saves your neck!! I’d rarely bothered previously with my tripod due to the contortions needed. I’ve covered the trigger grip with thin neoprene so my hands don’t freeze on the cold metal. For overhead viewing, I use my 12x50's on a zero gravity chair. This gives me a lot of freedom to view great swaths of sky. I also own a tripod, but overhead views past 45 degrees is just too much and neck strain kicks in after only around 10 min of viewing. The tripod always provides more stable views, but again, overhead viewing with a tripod and straight through eyepieces on any binocular is not comfortable in the long run. So, I would suggest getting a pair of binoculars with 45-90 degree eyepieces, or use a zero gravity chair, or use a parallelogram mount and a zero gravity chair. The views with the zero gravity chair and hand holding isn't as stable, but for me it is the best solution using my 12x50 Pentax when looking overhead. Edited by Miranda2525, 06 February 2019 - 05:19 PM. Viewing through binos from a tripod may not be comfortable for some, but for me, it certainly works just fine for shorter viewing sessions when I don't want to bring out a p-gram. I just time my viewing so that I'm looking at objects that aren't at zenith. There's a lot of objects up there to look at and they move pretty fast, actually. I hear a lot about not being comfortable above 45° elevation but it's really an individual thing; you just can't say what will work for others except in a very general way. Not all necks are the same. I still don't have a problem getting up to around 70° with my tripod/head setups with the right bino. A good, sturdy tripod allows me to hold onto it and actually lean on it some to steady myself while I view. Call me a tripod hugger if you will. Binoculars with short ER like my 16x70 FMTs are more difficult to look at high angles with than long ER binos like my APMs. I've compared both binos on the same setup and the APMs allow probably 10-15° more elevation than the Fujis. It's because I have more leeway in how I can pivot my binos onto my browbones and still maintain a proper eyepoint to see the whole FOV. With the Fujis I have to keep my face more squared up with the binos if I want to see anything at all. How about 100% sky coverage (that's 0-90* Alt / 360* Azim) for an entire night without ever having to get up to re-arrange anything at all ? Plus my neck & back have thanked me ever since. Edited by Bob4BVM, 07 February 2019 - 01:12 AM. You have to copy & paste it. After a lot of trial and error with many different bino mounts, I finally settled on the Manfrotto 475B. The great thing about this tripod is the hand crank which allows you to move the binocular up and down as you move from horizon to zenith, while at the same time keeping your eyes at the same location. Another great thing when coupled with a higher capacity fluid video head is the ability to star sweep and have the binocular stay where you leave them. I hate drifting binoculars. yeah that's weird, I took it right from the url line. Edited by Bob4BVM, 07 February 2019 - 01:21 AM. I've found this problem with pasted URL links on CN as well. Sometimes a link doesn't take; I don't understand why. You can test it in the post preview. If you don't get a pointer when you hover over the link, delete it and try pasting the URL again. One more option not yet mentioned is to use a flat mirror(s) mounted in front of the binoculars. That's cheaper than buying right-angle ep binoculars. 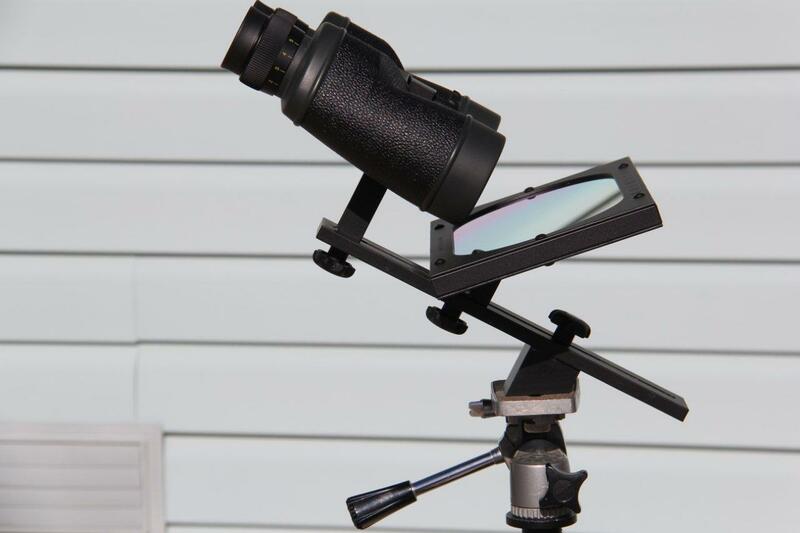 Though that's probably not for a beginner, as the view will be mirrored and you can't have a direct match between binoculars' pointing direction and the magnified view (You can add a GLP, but still). A bare photo tripod for high altitude observing seems to be having a wrong geometry and dangerous balance. At the minimum, you need to add a horizontal arm with a counterbalance weight to the system. That's, by the way, could help to raise binos higher as well. I can see a monopod (which you seems to have too) playing that role after adding a couple of mount points to it (one to attach the free hanging counterweight and one to the tripod's head). Edited by halx, 07 February 2019 - 03:09 AM. Thanks agree with Rich V.
On a burget, used Bogen tripods are the way to go. They're professional quality and available for very little if one is patient. I regularly check my local Craigslist. A 26lb rated mount that's around $50, I just buy it, someone I know will need it sooner or later. Sometimes it even me. The good ones have a spreader that braces the legs. The 3035, 3036, 3050 and 3051 are all basically the same. The 3050-51 have a release lever so the legs can be extended or shortened very quickly. They all generally have 3 section legs and all have center columns with cranks. Hight is in excess of 7 feet. There's also the 3046 and the 3058 and 3068. The later two even sturdier. If there is a 2 in the second digit rather than a 0, it mean the tripod is black anodized. A 3246 is the black version of the 3046. Bogens were manufactured by Manfrotto and most are still made with Manfrotto numbering. That's my tripod! I like it too, for the same reasons. This fairly inexpensive Dolica pistol grip mount works ok but needs a better tripod than the one pictured. Near zenith is ok.
Edited by brightsky, 11 February 2019 - 02:25 PM.